There are currently 4,570 users on this website. The 293 is MNH. I like reading peoples opinions on what things would grade at. Good, bad, ugly and indifferent. I picked these up last year at the Siegel Weinberg sale. The 15 would probably grade less, although it's a very nice margin example. It has fine philatelic appeal, but it should never be graded, which is simply a mathematical formula that does not take anything else into account. The 293 would get a 75 at best. The 15 will grade very high. 90-95 assuming no faults. Neither PF or PSE penalize for extra margin on imperforates. With the design clear by far on all sides, you have a beautiful stamp that will grade well. That stamp would be a bit hard pressed to get a 90 (although it might get one), let alone a 95 from the PF. A few minutes of looking at the website will prove that. For example, the stamp with cert 537211 has better balanced margins and larger at the bottom margin and only got a 90XF. Unless I was planning on selling it in the near future, I personally wouldn't bother getting a grade for the 292 (293 is the $2 value). The beauty of your stamp is the guideline and margin showing that it is not reperfed (it's position would not have a straight edge). If I ever get a 292, I would send it in just to be sure it wasn't reperfed - yours isn't. Only question might be regumming since the description was NH but that's easier to detect by a non-expert. It's a great looking stamp to me! A highly graded one gets crazy expensive. Not sure I agree about regumming being easier to detect. Like reperfing, some are easy to spot and some are difficult. And some are VERY difficult. 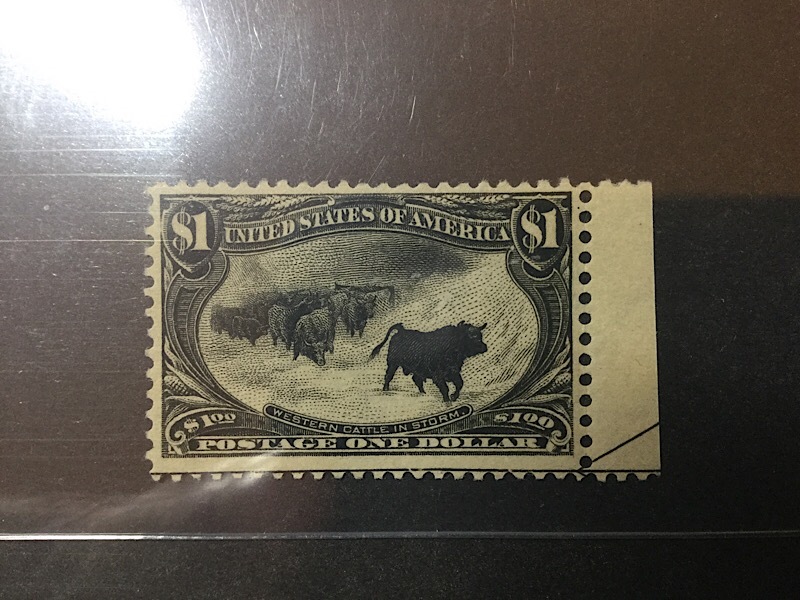 For grading imperfs, they "square off" the stamp by windowing it to the largest rectangle aligned with the stamp and ignoring the parts outside the rectangle for centering and margin size. Faults outside the rectangle count. Both PSE and PF would grade these the same, IMO. I've never been a fan of PSE's downgrade of guidelines along perf edges. I actually find guidelines comforting as evidence of reperf or not depending on which edge they fall. Does PF grading do the same? canyoneer, PF also reduces the grade for stamps showing a significant portion of a heavy guideline (but they don't say how much). PSE treats it like a minor fault (but acknowledges it isn't actually a fault, they just treat it that way for grading purposes) -- so at PSE, they had a chart/grid that showed exactly how various faults would affect the numeric grade. For a stamp like the above 292, the guideline would likely be a 5 point deduction, from 75 to 70 (assuming otherwise sound). "For imperforate stamps, an owner who doesn't mind mutilating all the stamps surrounding the one to be graded can easily achieve the highest possible grade, but by what collecting standard should that practice be encouraged?" stallzer, I'm quite certain the free market will eventually prevail. 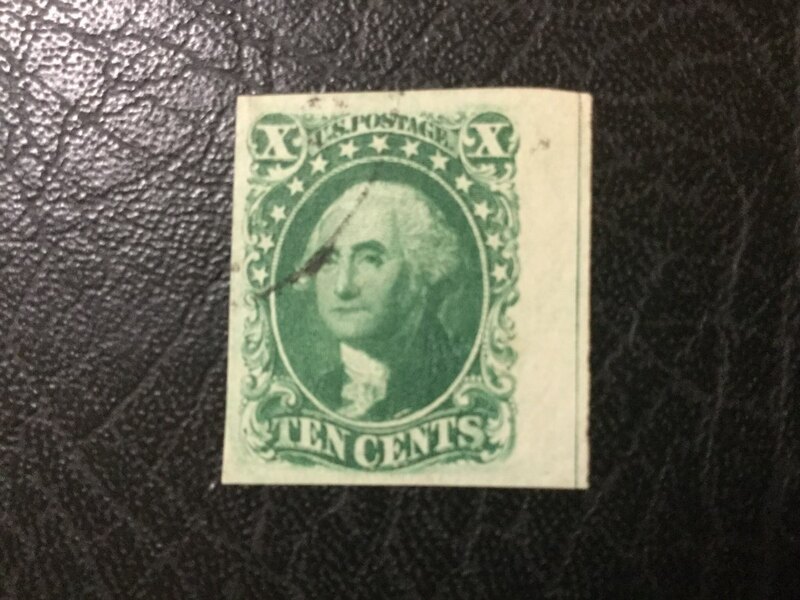 Logically, a 100/100J imperf should always be worth something less than a block of 9 in Average (cut into) condition. Once graded imperfs drop to that logical & sustainable price level, the practice of chopping up multiples will logically cease. I don't get the chopping up of imperf blocks to get high-grade stamps, but I haven't seen it done with 19th century stamps. but I haven't seen it done with 19th century stamps. Have a search through the forum here. There have been quite a few threads where we've found multiples of the 1851 - 1861 1� Franklins butchered for the sake of 1 "jumbo" piece. It took 0.92 seconds to lick this stamp.